A) Programs are divided into few sections. The main part is the competition section with a focus on feature film selection – which selected films compete for four prizes: 1) best film, 2) the best female achievement (not acting), 3) public price and 4) The festival’s special prize. BaNeFF use to have 12 films in competition. Jurry is created by Swedish filmmakers. Professional BaNeFF 2016 jury was: Cyril Hellman, Olgica Lindquist, Tobias Helmet, Hanna Andersson. This year the main festival, we will spread in the wider Stockholm region after ZITA premiere in Kungsangen Kulturhuset and Haninge cinema Cosmopolite – with screening of the entire festival. B) We usually invite filmmakers to their respective films to Stockholm and other cities BaNeFF to present their creations in a closer conversation with the audience and meeting with filmmakers from Sweden. Every screening at the festival has mingle before and after the movie. C) the last five years BaNeFF appeared Zita, as well as 10 cities around the country Västerås, Malmö, Norrköpting, Växjö, Lund, Umeå, Orebro, Östersund and cities in Norway, Oslo and Bergen. BaNeFF main festival usually travels as BaNeFF tour, a few months after the Stockholm premiere together with invited festival guests. BaNeFF on tour can be extended until December. D) This year we are preparing special section GATEWAY TO EUROPA – TRANS CINEMA NATION* (name ® M.A.M.M.A. production). Cinema nation who are in a transit – from more perspectives. TCN is section that relates to the countries trying to find their identity, fight against the severe changes in society, independence, equality questions and minority definition, faithful confusion, including bigger streams of people escaping from/ or passing through these countries to find the peace … We see BaNeFF countries as a GATEWAY to EUROPA*. In the same time Europe is influenced with this transit on more levels. We would like to see movies from these countries – the movies, we do not see often. This year BaNeFF 2016 had a wonderful film from Bulgaria. And our plans for the 2017 edition is to focus on 2-3 Trans Nation production countries such as Moldova, and for example, Hungary, Ukraine, Latvia, Georgia. Some of the countries have great production but with no connection to the Nordic countries: Some of them are completely without local film support and the Festival organization. It will be challenging both for us organizationally but also to the countries to establish a new collaboration, incl. marketing and audience in Sweden. E) Around program that is always with Q & A with BaNeFF guests panel, visiting the SFI, Si, and the occasional meeting with movie producers and creators from Sweden, exchange of experience and new production opportunities. F) SNOWE – Women in Film, Creative Networking, created during BaNeFF to continue to grow. Together with SI we make the third edition SNOWE projects in Macedonia. BaNeFF use to organize separate panel during BaNeFF focusing on women in the film industry and more specific challenges women have as filmmakers. BaNeFF is not exclusively turned to female creativity in film selection, but openly working towards raising the woman’s presence in film bransch. G) BaNeFF doc: short – special edition of BaNeFF doc: short, we are planning in Kungsangen, Zita, and the Cosmopolitan cinema on 21 December. With about 30 short films and documentaries. Doc: short part has separate viewing times in December 20-21st, as natural part of BaNeFF main Festival form more marketing purposes and to gather forces to carry out both in the right way. In order to concentrate efforts, we have introduced more cooperation with Doc and Short Film Festivals around the world. Last year with Al Jazeera International Documentary Film Festival – Doha Qatar and Sarajevo Prvi Kadar. This year we will have cooperation with GMIFF – Green Montenegro International Film Festival, since Al Jazeera has no Festival this year due situation in region. H) BaNeFF 2017 Summer Edition – we started this year and will continue together with Zita with display of BaNeFF 2017’s best films. I) Cooperation with SVT continues together with other distribution channels. J) BaNeFF films selection in the main festival is up to 50% youth-friendly and created for young people. We may in the future consider that children / youth-friendly movies should be visible better. We are welcoming schools at the screenings, or to make the extra screenings for them – which in turn are film distribution, we already do with the different partners. foto Johnny F. – MALMÖ PUBLIC AWARD for film To The HIlt, by Stole Popov and screenwriter Goran Stefanovski as a most favorite movie in Malmö regarding the public. 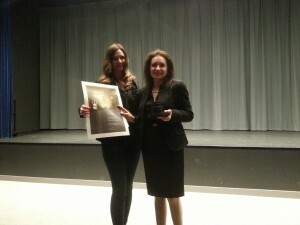 At the picture ambassador Ms Aleksandra Nakeva Ruziv, and BaNeFF member Jelena Mandrapa in Stockholm cinema Cosmopolite.